Amber Evans is originally from Brisbane, Australia, currently based in New York. 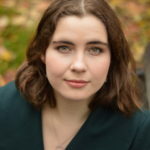 A recent graduate of the contemporary classical Masters at Manhattan School of Music under the tutelage of Lucy Shelton, she premiered over thirty new vocal works and became well-versed in modern contemporary classic works of the last few decades. Previous summer engagements have included the Cortona Sessions for New Music, Darmstadt Summer Music Festival, Melbourne International Singer’s Festival and the Contemporary Performance Institute as part of Mario Davidovsky’s Composer’s Conference. An avid chorister and ensemble singer, Ms. Evans can frequently be seen singing with the Cathedral Choir at St. John the Divine, where she was recently a featured soloist in Arvo Pärt’s Miserere, Choir of St. Luke in the Fields, and the New York early music vocal group, Pomerium. Ms. Evans is also a featured soloist on the CD of Poul Ruders’ opera The Thirteenth Child under the Bridge Records label, due to be released in 2019.